Four people were killed when a US Air Force (USAF) helicopter crashed during a "low-level" training exercise. The HH-60G Pave Hawk, based at RAF Lakenheath in Suffolk, came down at a nature reserve in Cley next the Sea in north Norfolk on Tuesday night. Emergency services and military personnel remain at the crash site, which is a marshland nature reserve. A 1,200ft (400m) area is cordoned off and the A149 through Cley is closed. The public are urged to avoid the area. The aircraft was carrying live munitions and police said they were investigating the nature of the weaponry, which may pose a risk to the public. Assistant Chief Constable Sarah Hamlin, of Norfolk Police, said: "I would like to pass on my condolences to the family, friends and colleagues of those US Air Force personnel who have sadly lost their lives in this tragic incident. "I would urge the public to stay away from the area - the cordon and road closures are in place to allow our experts to carry out these processes safely and there is no risk to members of the public if this section of marshland is avoided." A second helicopter from RAF Lakenheath was also in the area at the time of the crash and sent to the marshes to try to assist - it remains at the scene while the investigation continues. Inquiries into the cause of the crash, as well as the recovery of the wreckage and the second aircraft, are expected to take a number of days to complete, owing to the geography and the munitions from the crashed helicopter. A police spokesman said an environmental assessment would also take place. Details of the four crew members will not be released until next-of-kin have been informed, police said. They added it was not believed anyone in the surrounding area had been injured. An RAF Lakenheath spokesman said: "The aircraft, assigned to the 48th Fighter Wing, was on a low-level training mission when the crash occurred." 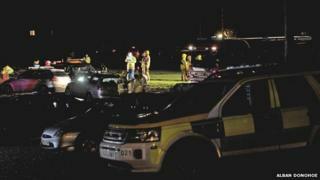 The helicopter came down at about 19:00 GMT and a spokesman said the first unit arrived at the scene at 19:53 GMT. The scene of the crash is near a coastal village popular with birdwatchers and walkers. The helicopter came down on marshes that were badly flooded during last month's tidal surge. The cause of the crash remains a mystery. The weather conditions are good and seem unlikely to have been a factor in what happened. Police are assessing the scene and the area is likely to remain cordoned off for some time. Further clues are likely to emerge at first light. Suzanne McKnespiey, who runs Cookie's Crab Shop, in nearby Salthouse, said she heard the sound of a low aircraft overhead between 18:30 and 19:00 GMT. "I quickly looked out of the window and it was a helicopter," she said. "It was low and very loud. It flew overhead and out towards the sea, going very fast. "We're used to hearing helicopters here but not that low." She said she was shocked to hear the news of the four deaths. "It's terrible. It's very sad and makes you feel sick to the pit of your stomach," she added. Media captionSupt Roger Wiltshire: "The helicopter had a crew of four and, sadly, at this time, we believe all members have died"
"It makes you realise all your troubles are little ones." Mrs McKnespiey's husband Peter said he heard what he thought were two helicopters passing overhead. "One sounded not quite right. The next thing I heard was a siren, maybe 10 minutes later but I didn't think much more of it. "Then there was a lot of activity. Blue flashing lights and sirens." He said he understood the crash had taken place near a raised bank known as East Bank, above the flooded marshland. Michael Girling, who was also in the area, said he heard the impact of the crash. "I thought the helicopter had landed on the beach," he said. "It had obviously ditched." A spokesman for the Royal National Lifeboat Institution said three crews were launched before being stood down soon after when it was established the aircraft was onshore. The 48th Fighter Wing, also known as the Liberty Wing, is assigned to the United States Air Forces in Europe. In addition to HH-60G Pave Hawks, it is home to squadrons of F-15 Eagle tactical fighter planes and F-15E Strike Eagle dual-role fighters. Military aviation analyst Roger Smith said he was "very surprised" this type of helicopter was involved in a crash. "It's a very safe outfit... well equipped to fly in poor weather with a highly-trained crew, used to flying at night," he said. He said the crew would normally be made up of a pilot, co-pilot, crew chief (flight engineer) and gunner. "Its main role is combat air rescue when an allied pilot is shot down behind enemy lines," he said. "This has to be done in the cover of darkness so they have to be able to fly in the dark in bad weather." Retired USAF colonel Rick Davis added: "I would imagine the H-60 has the best safety record of any helicopter that the United States military has ever owned." Cley is one mile east of Blakeney and four miles north of Holt, on the main coast road between Wells and Sheringham. The village has a nature reserve, famous as a bird-watching site. Aviation expert Chris Yates told BBC's Today programme: "This area of the country has lived with military operations for an awful lot of years, and it's rare for accidents such as this to happen. "We have to be mindful that these are military flyers and they are the best, of the best, of the best. "It would be unusual, once we get through this investigation, to find that this was pilot error; it might be more mechanical fault."